I have been to the rustic lanes of Delhi 6 twice. Once when I was a kid, and other when I was a bigger kid. The other visit obviously will have lasting memories through my life. When you come out of the Chawri Bazaar metro station, which is a relic of the 21st century design, expect the unexpected. Architecture and artefacts outside the station are from another era. Time it seems has a different pace here. The experience that you get here, will be no different from when you go to the old part of any city. But the mix of tradition and modernity that you get to see in Delhi is unique. The old walled city was established by Shahjahan, and was called Shahjahanabaad or rather 110006 as in the Postal Identification Number Code of the Indian Postal Department. People who have lived there for generations would sure have feelings about the place which I might not be able to reflect at all. For all my life I have never lived in such a locality. There are many things that interested me in this part of Delhi. Apart from historical significance it has one of the largest old book bazaars that I have ever seen. And since I am a bibliophile [see older post here], this is a “Mile long candy shop” for me. Anyways first I came to know about Delhi 6, the film by the song Masakali [Singer: Mohit Chauhan], in which Sonam Kapoor steals the show. So immediately got the entire soundtrack. And it is amazing. While writing this review I am listening to the same sound track. Rahman, as usual has done a lot of hard work for this too. Just listen to the variety of musical styles he has used in the film and that too to the best of the songs. The other favourites are Arziyan [Singers: Javed Ali, Kailash Kher], Kala Bandar [Singers: Karthik, Naresh Iyer, Srinivas, Bony Chakravarthy] and Delhi 6 Title Track [Singers: Blaaze, Benny Dayal, Vivianne Chaix, Tanvi Shah, Claire] which proves that no genre of music is beyond Rahman. He will do music from all around the globe, still retaining his unique style. Rahman has taken music to another dimension. So much about the music. It is defnitely one of the better contemporary OSTs that I have heard. 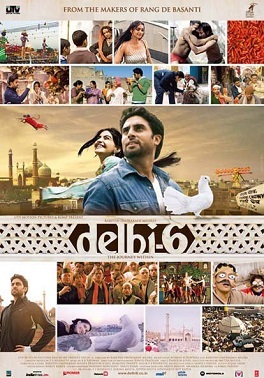 Then came the posters and the trailers of Delhi 6. The design of the posters was also good. All this raised my expectations about the film ….. But, alas, if you have done these two, just stop there, this is the best part about the film. Rather than watching the film, I would recommend to buy the audio CD and be happy with that. If you want to see, how a director with a good cast, good location and lots of budget can screw up, then Delhi 6 is a fine example of that. ROM short for Rakesh [oops Rakyesh] Omprakash Mehra, thinks that whatever he will serve on the platter, public will accept. But sorry ROM, I had high hopes from you, you disappointed me. I don’t even need to compare Delhi 6 with your previous work viz. Rang De Basanti, Delhi 6 is by itself a disaster. Abhishekh Bacchan plays Roshan, who is a ABCD. He returns to Delhi with his granny played by Waheeda Rehman, who is counting her last days. They start living in their ancestral house in the old lanes of Delhi 6. The come to Delhi during Raam Leela, and the film ends on dusshera. As the film develops more characters are added to the cast. Some of the shots which capture the spirit of the walled city are really well taken, but this is the better part of the film. If you look at the content of the film in terms of the story, the film is a bore. The story does not go anywhere, rather there is no sense of direction. So ROM becomes the non-director of the film. Why do you need to produce such films Mr. Screwwala? If you look at all the actors that are the part of the film, they are by themselves great. But with their characters in the story, the entire thing story does not fall into place. The events in the film are themselves non connected to each other and the characters as well. And one of the best actors in the film is the Kala Bandar, who had the potential to make or break the film. Unfortunately, Kala Bandar did break the film. Mr ROM, I think you had intentions of making the film for fundamentalists on either side of the Hindu-Muslim divide, then you have failed miserably. Another suggestion for the title of the film would be “Religious Fundamentalism for Dummies”. But the film fails to convey the message to them. It begs the question to be asked. The hysteria about the kala bandar in masses and the media is common place in these days of the information revolution. To have a look at worst of them, just tune into India TV, by far one of the worst cases of sensationalizing the news that I have seen. Why don’t they have a provision for banning such media production houses. Though Mr ROM, you do media bashing in your film, your film itself is no better than the channels that you have bashed. The character of Roshan is a dumb one. He is really ABCD. If he had died in the film, I am sure he would have got the Darwin Award. For those who don’t know or don’t want to visit the link Darwin Awards are given to the individuals who have done a great service to the human race, by deleting themselves from the gene pool, by killing themselves in stupid and idiotic ways. So Darwin Awards are given only posthumously. Unfortunately the character of Roshan does not die in the film, so we Indians are depraved from that Award, at least for this film. I think that the Kala Bandar is the residual self image of Roshan’s character, which comes out in the end and meets an end. Mr Bacchan Jr, why don’t you think about the movies that you work with, wasn’t Drona a lesson enough. And as for Sonam Kapoor, babe I am sorry for you, maybe you should consider better roles in your next film. The jodi of Gobar and Jalebi played by Atul Kulkarni and Divya Dutta outperform the rest of the crew, kudos to them. Anyways the climax is the real anti-climax of the film. Mr ROM why can’t you be a bit subtle about the content, I think you don’t believe that the viewers of your movie have some analytical capacity, why the hell do we need the narrator to tell what is evident? Final Rating: 1 out of 5; the music and the posters are much better than the movie itself, be content with that. This entry was posted in a r rahman, darwin awards, delhi 6, movie, people, rakyesh omprakash mehra, review. Bookmark the permalink.